Join us on Friday April 5th at gallery nrc and help celebrate the 4th anniversary of the gallery. This year all of the artists who have displayed work at the gallery in the past were invited to be a part of the show. Photography on display during the month is from Michael Calanan, Neil Corman, Catherine Etherton, Ahron R. Foster, Debra Lee Fanatia, Brenda Frezeman, Jeremiah Johnson, Lesley R. Kerr, Andrew Lucchesi, Bart McLeroy, Sandi Pfeifer, Fred Reim, Marian Rubin, Aleksei Saunders, Theodore A. Stark, Dan Stone, Jeff Taylor, Daylene Wilson, and Chris Wells. The gallery will be open for normal hours as well as the monthly First Friday Art Walk, on Friday April 5, 2013. This also marks the 15th Anniversary of the First Friday Art Walk along Tennyson. 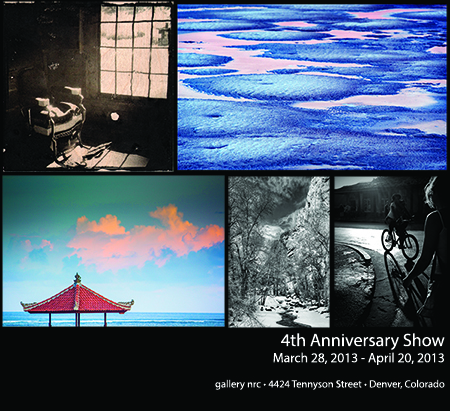 The 4th Anniversary show runs from March 28, 2013 – April 20, 2013.